This well (originally Well 385) has been turned off. LADWP wants to turn the “new” well on for “testing” purposes. Comments are due by October 23. Click here to fill out the Adopt Application. Urge the LADWP Commissioners to say YES to the Owens River Water Trail. 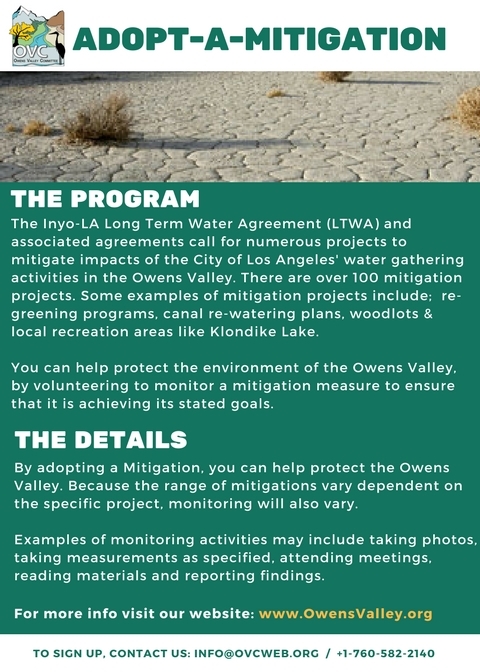 For more information, please contact us at 760-582-2140 via the Owens Valley Committee email at info@ovcweb.org. Here are three graphic representations of the Owens River Water Trail Project. Thank you to the Inyo County Water Department staff for supplying them.